Sylvester Stallone’s testosterone-powered The Expendables took the weekend box office title with $35 million. Chick flick Eat Pray Love was a big opening for Julia Roberts, coming in second. It seems America was looking for a high octane action flick and co-writer-director-action hero Sylvester Stallone delivered with a tale of mercenaries sent to overthrow a South American dictator. Stallone not only broke records by being the only actor to have a hit in five consecutive decades, he also broke his own record. The Expendables goes down as his biggest release to date. A key element in this win was Stallone’s 1980s action colleagues, Arnold Schwarzenegger, Bruce Willis, Dolph Lundgren, Mickey Rourke and Eric Roberts. That backup was advertising gold, with the old school heroes and villains calling to mind the down and dirty, non CGI action of yesteryear. 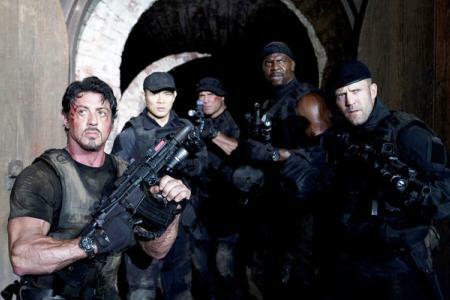 The Expendables‘ actual heroes are Stallone, Lundgren, Jet Li, Jason Statham, Steve Austin, UFC fighter Randy Couture and former NFL player Terry Crews. Rourke, Roberts and Stallone’s Planet Hollywood pals Schwarzenegger and Willis portray behind the scenes players in the movie. The Expendables hasn’t opened on the international track yet, but there’s already talk of sequels. Julia Roberts’ spiritual road trip movie Eat Pray Love may mark the first time her brother Eric can say he bested his sis at the theater! The much hyped film based on the much adored book came in second with $23.7 million. Not a bad opening and one of the best for Roberts since America’s Sweethearts. Box office previewers say not to count this travelogue out yet. While the flick has led to a massive increase in book sales, there’s still next week and Eat Pray Love is counting on a long life at the box office. The two new winners knocked The Other Guys down to third, with $18.0 million, while Inception took a big drop in viewers, bringing in $11.3 million this weekend for fourth place. Scott Pilgrim vs The World keeps a spot in the top five with $10.5 million. Despicable Me took sixth place with $6.7 million; Step Up 3-D came in seventh with $6.6 million. Salt and Dinner for Schmucks came in just behind for eighth and ninth, respectively, while the puttering Cats & Dogs: The Revenge of Kitty Galore barely maintained a spot in the top ten with $4.0 million. Toy Story 3 ended its nine week run in the top ten. It walks away with the global crown for top-grossing animated feature of all time, with an international take of $940 million. It came in second domestically, making over $400 million — an impressive take but not enough to knock Shrek II out of the top spot. Next week, Eat Pray Love hopes to see more ladies at the movies, but there’s new competition coming. In addition to Jennifer Aniston and Jason Bateman’s uber-hyped The Switch, Lottery Ticket and Piranha 3D hit theaters next weekend.